. . . one nation under God, indivisible, with liberty and justice for all. I pledge allegiance to the flag of the United States of America and to the Republic for which it stands . . .
Go grab a $1 bill and check out the back right circle called The Great Seal. 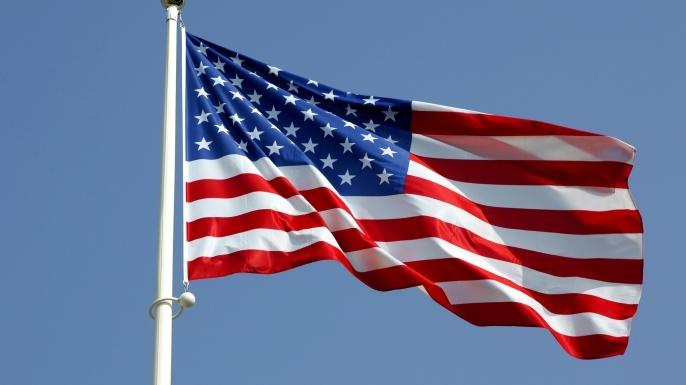 This American symbol has many little known secrets. In the beak, the eagle has a scroll with the motto “E PLURIBUS UNUM” which means “out of many, one.” Over its head is a field called a “glory” with 13 stars referring to the original 13 states. In front of the eagle is a shield with a shaded top called a “chief” and vertical stripes called “pales”. The stripes represent the states joined together, supporting a chief, which unites the whole and represents Congress. Many students ask what is the meaning of The Great Seal of the United States of America. It is commonly found on US passports and other official documents. For those unfamiliar, check the back of the $1 bill in the right side circle. The Great Seal has a picture of a bald eagle with its wings outstretched, holding 13 arrows in one claw and an olive branch in the other. The arrows refer to the 13 original states and the olive branch symbolizes a desire for peace. The olive branch has 13 leaves and 13 olives also referring to the original states. Take a break from your 4th of July celebrating tomorrow and check back here to learn more amazing secrets from the Great Seal of the United States of America. Continuing to observe the left circle on the back of the $1 bill are more fascinating secrets. At the top of the pyramid is a triangle with an eye surrounded by the sun’s rays known as a sunburst. The eye symbolizes God leading our nation. The US Founding Fathers who created this design felt God had established a new order for the ages and that the Coat of Arms should reflect this characteristic of the nation. The Latin above the pyramid ANNUIT COEPTIS means, “HE (GOD) HAS FAVORED OUR UNDERTAKINGS.” The Latin below the pyramid NOVUS ORDO SECLORUM means, “A NEW ORDER OF THE AGES.” In fact it was July 4, 1776 when a new order began based on the Declaration of Independence. Do you wonder what the symbols in the right side circle of the $1 bill mean? Come back tomorrow for the surprising answers. Leading up to our favorite holiday July 4th, we thought we would share some fascinating United States symbols you probably never noticed. Take a look on the back of a $1 bill and in the left circle you will see a picture of a pyramid. It was designed in 1782 and called America’s National Coat of Arms. At its base are the Roman numerals MDCCLXXVI. They stand for 1776 the year America was founded. A pyramid is historically recognized as a symbol of strength and durability. This pyramid contains thirteen layers of stone referring to the original thirteen colonies. Check back tomorrow for more American Coat of Arms dollar bill secrets. STARTING TOMORROW: Four days honoring America right through July 4th! See lots of little known United States fun facts to share with your entire family. On a personal note, I live next door to a surviving D-Day veteran from World War II. I thank him all the time for his heroics. I let him know that if it weren’t for brave people like himself, we would all be speaking either German or Japanese right now. Thank you Seth and all the people that have given their lives for what we will be enjoying this weekend. Have a happy and safe 4th of July. On this 4th of July weekend, please take a moment to thank a veteran or anyone that has served our country. The United States of America would not continue to have birthdays without them. It is because of these men and women, that we are able to have such fine celebrations as the ones this weekend.